©Bert Gildart: For a period of time I lived in the South and though I now live in Montana, I am constantly drawn back to renew acquaintances with friends I knew while in high school and then again in college (before transferring to Montana State University). In those years I was drawn more to the country side both for its excellent hunting opportunities, though I was also drawn because of an interest in the history of the Old South. Stretching 450 Miles: In recent years, Janie and I have returned often to the South, essentially because there is an incredible national parkway that allows me to see friends and renew my fascination with both the area’s natural history and history. It does so because the parkway travels past such places as Florence, Alabama (where I began college), and places me within striking distance of Huntsville, where I graduated from high school. And because I’ve returned so often, several years ago I convinced interpreters at the Natchez Trace that they needed a book that documented in both text and photographs some of the features this incredible area preserves. Because fall is one of the best times to visit the Natchez Trace, it is only natural mental images from this 450-mile long road should crop up again. Fall is beautiful throughout the country , and it’s the season along the Trace that has provided me with my so many recollections. In other words, the reds and yellows here in Glacier evoke memories from other parts of our nation, particularly when they are as splendid as those found in the South. First Major Research Trip: My first major fall trip was made in the late 1980s. 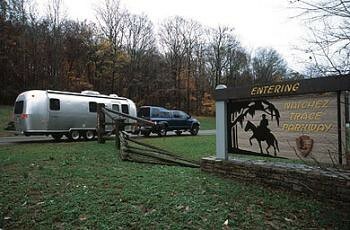 Winnebago loaned me a Mini-Winnie Motorhome, which I photographed and it provided a cover for Trailer Life that complemented my story for them. More significantly, that trip was one I made with my parents when I was single and the trip ultimately became one of their favorites. For that dear retired military couple who traveled the world, that’s saying something. In1990, shortly after I married Janie, we traveled the modern-day road, taking time to hike all sections of the ancient road. 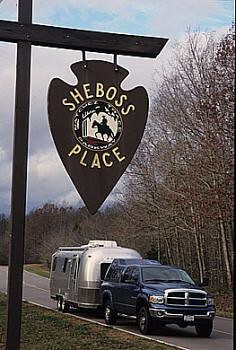 During that time, we lived out of our first Airstream where we completed gathering material for my Natchez Trace book. Below is a section from that book, which is available from the Park Service or from us. The book is $17.95 plus $2.00 shipping, and if you’d like to purchase an autographed copy from us, please send a check to me at my posted address . Include, of course, all your pertinent mailing information. 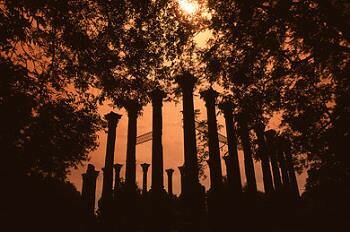 Stretching from historic Natchez, Mississippi, to Nashville, Tennessee, is a highway that parallels an old trail, a trail which once was a major thoroughfare for an emerging nation. Stepping from a pullout on the modern highway, Janie and I walked down a short path that ended where the much older trail began. Spanish moss on the branches above drooped over this pathway, while along the ground lay dense carpets of darkening leaves. Deeply eroded, the trail appeared ancient. 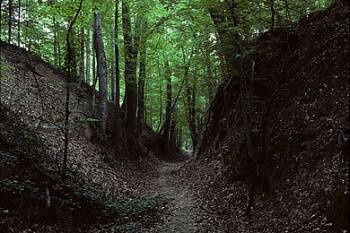 Here ran the Old Natchez Trace, a trail of sublime beauty that once had seen the passage of Pushmataha, Meriwether Lewis, Andrew Jackson, Aaron Burr, John James Audubon, General Ulysses Grant, Abe Lincoln’s father-as well as thousands whose faces remain nameless. Fate had smiled kindly on many of these travelers, but not all. One black night Lewis was mortally and mysteriously wounded. This entry was posted on Monday, September 24th, 2007 at 11:53 am and is filed under Books & Stories, Natural History/Conservation, Photography, RV Travel. You can follow any responses to this entry through the RSS 2.0 feed. You can leave a response, or trackback from your own site.